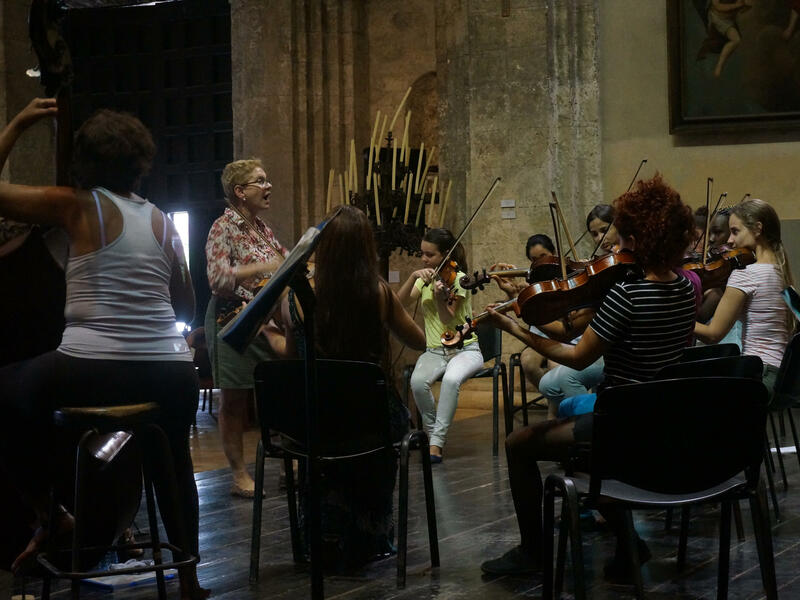 The Camerata Romeu rehearses at the Basilica of St. Francis of Assisi in Havana in November 2015. Cuba is famous for its music. A lot of people have heard of artists like the Buena Vista Social Club and Celia Cruz. But the country also has a long history of cultivating classical composers and performers. On a recent trip to Cuba, I met one group that stands out. In a country as stereotyped for its machismo as it is for its mambos, you might think an all-female classical ensemble would face an uphill struggle. But Cuban conductor Zenaida Romeu says that's not so. "Everybody thinks that Cuban music is just guitar, bass and guiro," she says. "But we have more examples for large orchestras, for ensembles, for choir — we have a very big, intense musical life here." Romeu founded her group, Camerata Romeu, 23 years ago. She wanted to show off the parity between men and women she saw in her native country. "Even in the 20th century, women had formed orchestras, and had been involved in the culture," she says. "At that time, I was in Spain, and I felt that the woman was not involved in society as we had had here, in spite that we are third world, and a tiny country. I felt that we had something to share with the world." Romeu was the first Cuban woman to graduate from Havana's conservatory as an orchestral conductor, a fact about which she is very proud. And that conservatory helps feed her orchestra. Young women generally join her group when they're about 20 years old, and they say that they love collaborating together. Yadira Cobo Rodriguez is the leader of the second violins and a composer herself. She's been playing with the orchestra for 14 years. She says there's a special energy to it. "Men have more strength, and women, you have a different feeling," Cobo says. "It's more angelic, more comfortable." Camerata Romeu is a string orchestra — made up of violins, violas, cellos and basses. And it plays the standard repertoire, like Vivaldi, Mozart and Grieg. But Romeu says some of the best composers from Cuba and beyond have written for her group, including Brazil's Egberto Gismonti (with whom they have recorded for ECM) and Cubans like Leo Brouwer and Guido López-Gavilán, who heads the organization of the contemporary music festival for which I had traveled to Havana in the first place, and whose Camerata en Guaguanco has become a signature piece for the Camerata Romeu. "So this is a privilege, because they work a lot in silence, in solitude, and they have a destiny: our orchestra," Romeu says. "Now, the literature of a string orchestra is bigger than when I founded the orchestra. So any orchestra now could be interested. If they are interested in playing Cuban music, I have music to share with them." Camerata Romeu hasn't had a chance to share with listeners in the United States, though, since 2001. "Well, I have a dream to return to the U.S. We have been four times there ... but before the year the towers fell down," Romeu says. "After that, we had a silent time in between our countries," she continues. "So it's a dream to renew the relationships, the cultural relationships, and we can go again. We want to open again those spaces for our orchestra. We have been working hard all this time. I would like to share this music, and the happiness of doing music." With any luck, Camerata Romeu will be one of the groups to benefit from the thaw in relations between the U.S. and Cuba. Cuba's always been celebrated for its music, and many people have heard of artists like the Buena Vista Social Club and Celia Cruz. But the island also has a long history of cultivating classical composers and performers. On a recent visit to Havana NPR's Anastasia Tsioulcas found one group in particular that stands out. ANASTASIA TSIOULCAS, BYLINE: In a country as stereotyped for its machismo as it is for its mambos, you might think an all-female classical ensemble would face an uphill struggle. But Zenaida Romeu says that's not so. ZENAIDA ROMEU: Everybody thinks that Cuban music is just a guitar, bass and guiro. But we have large orchestra for ensemble, for choir. We have a very big, intense musical life here. TSIOULCAS: Zenaida Romeu founded her group Camerata Romeu 23 years ago. She wanted to show off the parity between men and women in Cuba. ROMEU: Women had formed orchestra and had been involved in the culture. At that time, I was in Spain. And I felt that the woman was not involved in society as we had had here. In spite that we are third world and a tiny country, I felt that we had something to share with the world. TSIOULCAS: Romeu was the first Cuban woman to graduate from Havana's conservatory as an orchestral conductor. ROMEU: I am very proud of that. TSIOULCAS: And that conservatory helps feed her orchestra. Young women generally join the group when they're about 20 years old. Yadira Cobo Rodriguez is the leader of the second violins and a composer herself. She's been playing with Camerata Romeu for 14 years and says the group has a special energy. YADIRA COBO RODRIGUEZ: (Through interpreter) Normally, men have more internal force. But women, along with internal force, there's sort of more of a calm, emotional feeling. Women are more angelic. TSIOULCAS: Camerata Romeu is a string orchestra - violins, violas, cellos and basses. And it plays the standard repertoire - Vivaldi, Mozart and Grieg. But Zenaida Romeu says some of the best contemporary composers from Cuba and beyond have written for her group. ROMEU: This is a privilege because they work a lot in silence, in solitude. And they have a destiny - our orchestra. So now, the literature of a string orchestra is bigger than when I founded the orchestra. So any orchestra now interested to play Cuban music, I have music to share with them. TSIOULCAS: Camerata Romeu hasn't had a chance to share with listeners in the United States, though, since 2001. ROMEU: We have been four times there, before the year that the towers fell. After that, we had a silent time in between our countries. But I have a dream to return to United States to renew the relationships - the concert relationships. And we can go again. I would like to share this music and the happiness of doing music because it's a privilege. TSIOULCAS: With any luck, Camerata Romeu will be one of the groups to benefit from the thaw in relations between the U.S. and Cuba. Anastasia Tsioulcas, NPR News, New York. UNIDENTIFIED WOMAN: WEEKEND EDITION is a production of NPR News, which is solely responsible for its content. Learn more about the music and artists you hear on NPR and discover new music by visiting npr.org/music. There, you can also watch a Tiny Desk Concert or get an exclusive First Listen of new music. Transcript provided by NPR, Copyright NPR.